There’s no point wasting too many words, the Sportbrake is a truly great car. Made in the UK and developed for the discerning driver who appreciates style with substance wrapped up in a package that radiates coolness rather than brashness. We tested the performance 3.0 twin turbo SDV6 diesel version a little while back and found it performed most admirably in rain or snow – quite literally too I may add. As much as a fan of the XF I may be, I find the Sportbrake to be a better all round package over the saloon and its styling looks mouth-wateringly classy without an overpowering status overtone – restrained opulence if you like. What we have here is a fire breathing, petrol eating, five door time machine with the same running gear as the high performance 5.0 supercharged F Type Coupe. For the statistically minded you have a quad cam V8 power plant that’s supercharged to the tune of a staggering 550Ps and skilfully mated to a ZF 8 speed automatic gearbox. In the F Type its all about noise and sensation – as we found out, but in this Sportbrake and indeed the superb XJ-R the driveline lives in an ideal home – smooth and refined… for most of the time at least. The RS Sportbrake is a true split personality performance estate, it all gels together and works with an emotional and enjoyable effect. Leather and chrome in abundance. Wing backed front seats are rather special. The cues of its time warping performance are there to see all round with carbon fibre spoilers front and aft, 20″ footprints (295 profile boots on the rear) and brake discs that look as if they could physically stop the world turning. 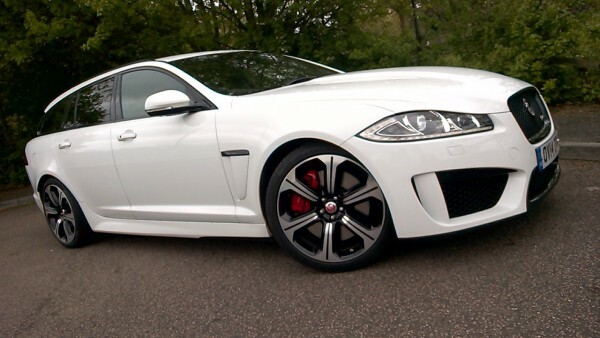 What Jaguar have done (rather tastefully I may add) is to blend the monstrous performance into the pretty bodyshape – its all very subtle yet noticeable but not harming the overall package, the most obvious clue is the dramatically reduced ride height. Gone is the chrome grille which has been substituted with a gloss back item fitted with a discreet “RS” badge. 5.0 V8 plant is supercharged and stirs up 550Ps of power and a disturbing amount of torque. Sounds so good too! The 5.0 V8 fires up with a grumble that sounds like a mash up of God clearing his throat and Brian Blessed yawning – its a hell of a sound that turns heads and makes curtains twitch early on a morning. Once the gears have been selected and you trundle away the noise level in the cabin never gets any louder than a deep rumble… rather like distant thunder on a summers evening – the calm before the storm perhaps? For most of the time when driving or cruising the RS behaves like any other premium estate car, all you have to remind you of the potential velocity under the right foot is that aforementioned subtle deep rumble up front. Give it a nudge as it were and press the volume pedal and you get a startling and pronounced reminder what this car is all about. If you have little or no experience of high performance, the RS will scare the living daylights out of the driver. In fact, to use the term high performance is rather underselling the RS package – we are actually looking at genuine supercar levels of speed and ability here. In terms of sheer performance, and the way the RS demonstrates its skills, can with all honesty be put down in words as astonishing. The standard sprint from zero to a mile a minute comes up in a blink over four seconds and the car is electronically limited to a maximum speed just short of 190mph – like I have mentioned earlier… genuine supercar standards here. In any circumstance, in any gear, at any speed, the power and the ability is there with instant effect as if switching on a light. Flat floor with rustic cargo lashing points. Never has a run to Homebase been so fast or so much fun! Obviously you have to acclimatise yourself with the car before you press on hard and once you do for the first time a lone driver may think or speak the odd four letter expletive. Its properly entertaining and yet cruises like a limousine at the national limit with just 1400rpm showing on the rev counter. Handling and ride are just as good too. 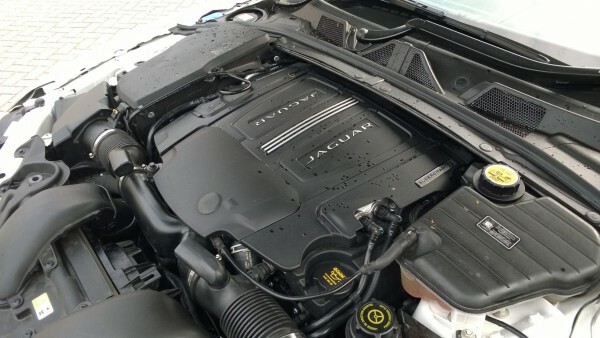 For sure the RS Sportbrake rides firmly around town and a deep pothole has you joggling around in the seat, but out on the highway the Jaguar rides with composure and calm. Should you opt for some G-force in the apex the RS Sportbrake corners flatter than a Riley snooker table with heaps of grip from the nose. Its traditional hydraulic assisted steering rack is high geared for nimble and fast cornering – all you have to be aware of is laying the traction down at the rear. As expected there is an active electronic limited slip differential, Jaguars drive control, sport and winter settings on the gearbox to give a helping hand but tail wagging will and can happen very easily. That said, its a very controllable car that’s also laugh out loud fun – Jaguar Land Rover chassis designers have certainly earned their Christmas bonus. 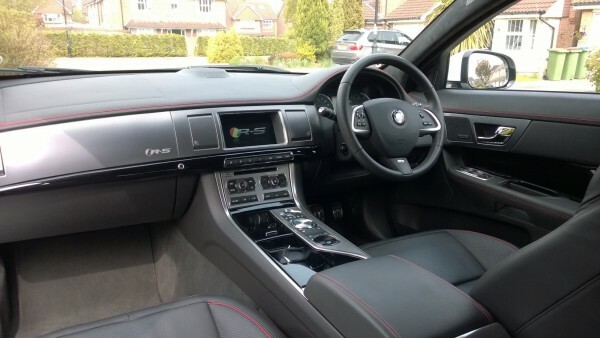 To get the right balance of ride and handling in a package that has to cater for the family man or press on harder kind of driver is incredibly difficult to achieve but Jaguar have managed to pull it off, it really is quite superb. The gearbox also features a paddle shift function that blips the throttle on manual down changes, this gives a jolly nice spit, pop and burble from the tailpipes for your extra enjoyment. Manual up changes are rapid and only detectable by the change in engine note but or most of the time I was just happy to let the computer controlled ZF 8 speeder get on and do its thing in fully automatic mode. Wet junctions and damp roundabouts can be entertaining to say the least, I found a way to avoid wheelspin or loss of traction was to engage winter mode. This alters the throttle pedal travel and engages second gear from a standing start – a rather handy function that stops you looking like a berk to lesser vehicle drivers. RS looks stunning from every angle. 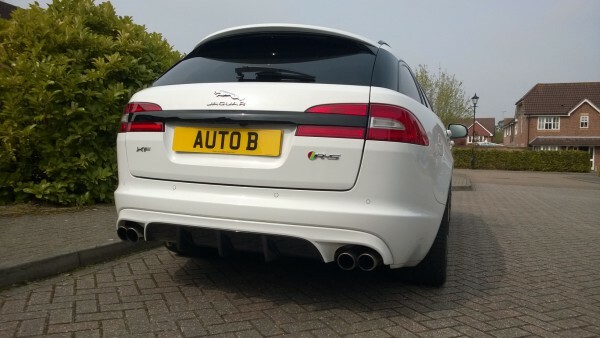 I loved the carbon fibre rear splitter spoiler and quad slashed tailpipes… and what a noise they emit! But this impressive showcase of handling, speed, British craftsmanship and performance comes with at a cost. The opening gambit for the Sportbrake RS comes in at £82,495 excluding options. Is that such a price for a well equipped and classy looking large estate car that drives like a Jaguar should but with exotic supercar performance? I don’t honestly think so and Jaguars recent awards in reliability polls means the car is built to seemingly go the distance. 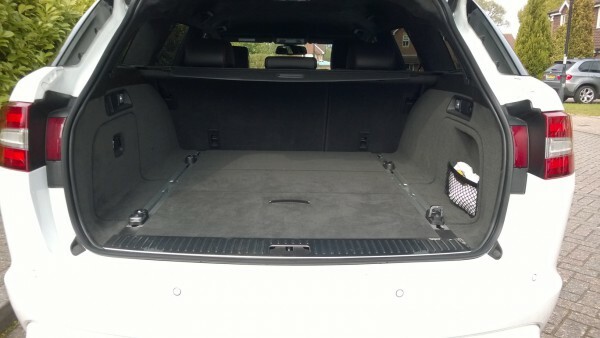 Its not the most frugal estate car I have experienced either. Average consumption showed the figure in the low 20’s but you know what? I didn’t care a hoot. When a car rewards you with this level of driver appeal, equipment, style and utterly mind blowing performance, the running costs become academic. If you can afford to buy it you can afford to run it as the old saying goes and when a vehicle gives you so much smile per mile you don’t mind the queuing at the fuel station so much. What can I possibly say that’s not been covered above. The Sportbrake RS is a damn fine showcase of what we Brits can do that other cannot. Style and substance with practicality makes the RS a fine machine for the kind of driver who is blessed with a dash of skill behind the wheel and a desire for that British of traits – restrained opulence. A well thought out cargo deck, plenty of equipment, an amazing stereo system and easy to use technology works in efficient alliance with race track handling and levels of performance that knocks out nearly all of its opposition. And yet behaves like a five seater limo when cruising at speed – its a very clever and stylish car that cannot fail to impress. Lets hope its replacement due in the not too distant future only improves this spellbindingly good Jaguar that not only takes the fight toe to toe with ze Germans, but in my view provides a technical knock-out. A family hold all with racing car performance Sir? then step this way. It’s one hell of a thing to drive… its not just a fast estate, its more of a genuine automotive experience that’s seldom found elsewhere. THE HIGHS: Blistering performance – Superb chassis – Superb brakes – Well equipped -Feels safe and solid – Stylish – Refined when cruising – Engine note to die for – Massive boot space – Incredibly rewarding to drive in all scenario’s – Exterior fit and finish quality is as good as the Bavarians – Good record for reliability. THE LOWS: Column stalks feel cheap – Not exactly frugal – Turning circle can be challenging – Not really a green machine – Rear legroom is tight – Some options are expensive that ought to be standard for example: Adaptive cruise control. VED bracket is eye wateringly high.